History: Over R28 million raised 2017. The Open Air School has been part of Casual Day since it started 24 yrs ago. Heroes are defined by their strength of character Now, more than ever, South Africa needs people to dig deep inside themselves, find the hero within and BE AN EVERYDAY HERO . This is the Casual Day 2018 theme that will take us a giant step closer to our ultimate goal – a nation that excludes no one, a nation that upholds everyone’s human rights and works for full inclusion. We want a South Africa in which all people have equitable opportunity and equal access to education, jobs, justice and more! Help us raise this banner in 2018. 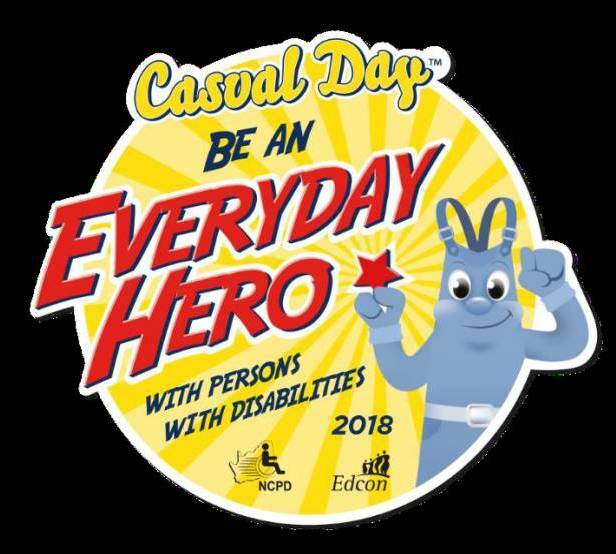 You are called upon to BE AN EVERYDAY HERO with persons with disabilities on Casual Day Friday 7 September. The most important accessory on casual day is the Casual Day sticker! In supporting this cause, you are being a hero and making a real difference to thousands of persons with disabilities across our land. So this Casual Day… and every day… BE AN EVERYDAY HERO with persons with disabilities! Tax certificates can be attained through School Bursar on request. Book stickers, pay now and be ready for 7 September 2018.